On May 14, 2015, the Meriden Police Department was reaccredited by the Connecticut Police Officers Standards and Training Council (POSTC). State accreditation is a process that is regulated by the Police Officers Standards and Training Council, also known as the Connecticut Police Academy. From left to right: Captain Mike Zakrzewski, Deputy Chief Tim Topulos, Cromwell Chief Anthony Salvatore (POSTC Council Chairman), Chief Jeffry Cossette, and Police Service Technician Thomas Zakrzewski. 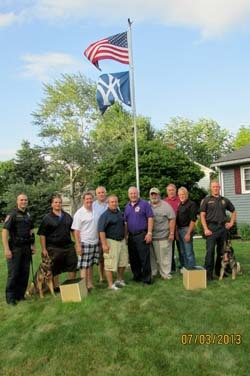 We would like to thank members of the Meriden Lions Club who recently donated $1900 worth of equipment to the Meriden Police K9 Unit for narcotics detection training. 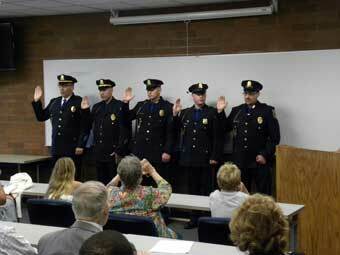 The Meriden Police Department is proud to announce the recent promotions of five members of the department. (Photo: Patrick Gaynor to Detective Captain, Anthony Carusone to Lieutenant, Michael Boothroyd to Sergeant, Christopher Fry to Sergeant and Jon Femia to Detective.) Congratulations to these individuals on their new positions. 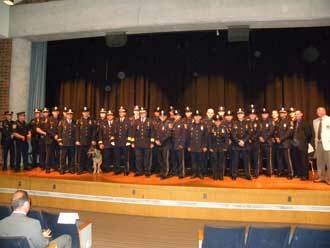 The Meriden Police Department recently held an awards ceremony at Washington Middle School. Nearly 70 awards were given out for acts of commendable service, valor, and bravery which occurred between 2008 and 2010. Congratulations to all receipients of awards! City Councilor Hilda Santiago presents Officer Christopher Griffin with a Certificate of Special Recognition for his outstanding work in DUI enforcement. 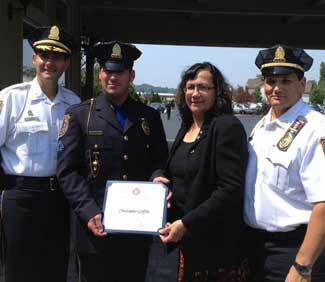 The certificate was presented on behalf of Congressman Christopher Murphy at the 26th annual MADD luncheon. Photo: Dep. Chief Topulos, Off. Griffin, Hilda Santiago, Capt. Michael Zakrzewski. 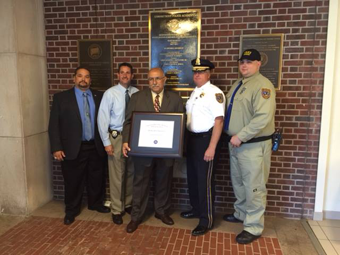 On May 2, 2010 The Meriden Police Department was officially recognized as a TIER One Accredited Law Enforcement Agency by the State of Connecticut Police Officers Standards and Training Council. Chief Jeffry Cossette has made professional standards an agency priority. Under Chief Cossette's leadership the Meriden Police Department has made significant inroads in terms of policy development and revision. The accreditation process was a yearlong endeavor of intense work and research. The Meriden Police Department is very proud of this achievement. The citizens of Meriden should also feel a sense of pride knowing that their police department is one of few to achieve this status. 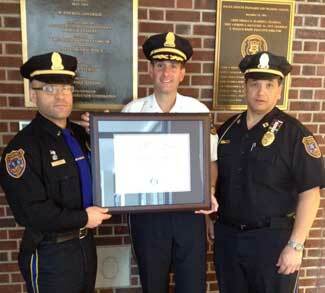 Photo: Lt. Salvatore Nesci, Deputy Chief Timothy Topulos and Capt. Michael Zakrzewski.